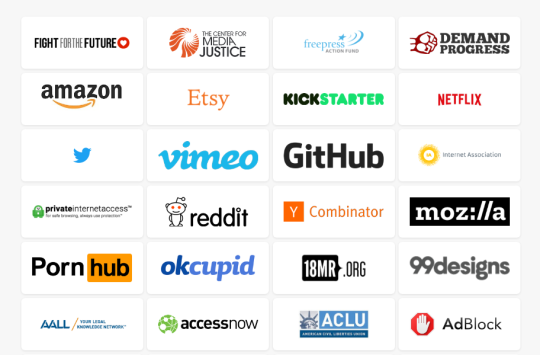 Twitter, Soundcloud, Medium, Twilio, Plays.tv, and Adblock are among latest major web platforms to join the Internet-Wide Day of Action to Save Net Neutrality scheduled for July 12th to oppose the FCC’s plan to slash Title II, the legal framework for net neutrality rules that protect online free speech and innovation. Companies participating will display prominent messages on their homepages on July 12 or encourage users to take action in other ways, like through push notifications and emails. More than 40,000 people, sites, and organizations have signed up to participate in the effort overall, and more announcements from major companies are expected in the coming days. Many popular online personalities including YouTuber Philip DeFranco, and dozens of major online forums and subreddits have also announced their participation. Companies participating include Amazon, Netflix, OK Cupid, Kickstarter, Etsy, Reddit, Mozilla, Vimeo, Y Combinator, GitHub, Private Internet Access, Pantheon, Bittorrent Inc., Shapeways, Nextdoor, Patreon, Dreamhost, and CREDO Mobile, Goldenfrog, Fark, Chess.com, Imgur, Namecheap, DuckDuckGo, Checkout.com, Sonic, Brave, Ting, ProtonMail, O’Reilly Media, Discourse, and Union Square Ventures. Organizations participating include Fight for the Future, Free Press Action Fund, Demand Progress, Center for Media Justice, EFF, Internet Association, Internet Archive, World Wide Web Foundation, Creative Commons, National Hispanic Media Coalition, Greenpeace, Common Cause, ACLU, Rock the Vote, American Library Association, Daily Kos, OpenMedia, The Nation, PCCC, MoveOn, OFA, Public Knowledge, OTI, Color of Change, MoveOn, Internet Creators Guild, and many others. See the full list here. Zachary Rosen, CEO of Pantheon, said: “We started Pantheon to make it easier for organizations big and small to succeed on the Web. But if strong net neutrality rules under Title II go away, it’d put both us and our customers’ innovation at risk."